Spectacular mountain views rise above the walls of a circular courtyard for your sculpture garden wedding. 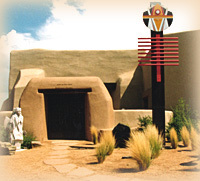 Striking works by Native American artists will join your guests to witness your marriage ceremony. Let our experienced wedding planners see to every detail of your Santa Fe wedding. 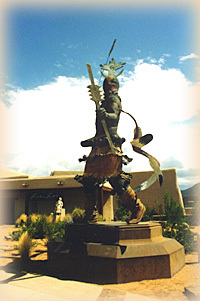 Located at the Museum of Indian Arts and Culture, the sculpture garden accommodates 80 guests. The Museum Hill Café next door seats up to 30 indoors or on the open patio for your reception. call 505.438.7116 or make a request online.